Blackjack is a very popular game all over the world. The game gained popularity in land as well as in online casinos and became the most frequently played card casino game. The history of one of the highly intellectual blackjack card game is not less interesting as the game itself. The history of blackjack has a very disputable origin. Some scholars believe that it is originated from the game that was popular in France in the 17th century. The game is called "vingt-et-un" (twenty-and-one). Others claim that blackjack took its roots from the Italian casino game known as "Seven and a Half." It is also believed that blackjack could develop from the game "One and Thirty," the Spanish casino game. Well, let's consider the games closely and try to find the similarities and differences from the blackjack as we know it. The main idea of the game is to get 21 points, which is similar to the traditional blackjack but blackjack rules are quite different. In the French "vingt-et-un" game dealer deals cards in rounds and players bet each round. Moreover, only the dealer has the right to double. Italian "Seven and a Half"
The main difference between this game and blackjack is that the Italian casino game was played only with the face cards (counting like "half") and the 8s, 9s and 10s. The aim was to get seven and a half points. The similarity with modern blackjack is that the players busted when they got more than the required number of points. 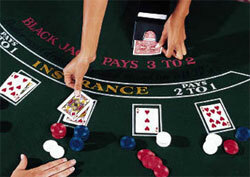 The main idea of the game is to get 31 points, which is different from the idea of blackjack where players aim to get 21. Moreover, the players are dealt three cards in this Spanish game instead of two cards in blackjack. No matter what was the real origin of blackjack, the game gained great popularity in Europe and then was brought to the USA where in 1958 the first basic blackjack strategy appeared. All in all, all of the above mentioned games have definitely contributed to blackjack game but it is very hard to tell how exactly the most popular modern game of skill developed and to name just one casino game it originated from.